The design results from addressing four primary considerations – the program, the physical context of the site, the ideology of design and the demonstration of environmental sustainability and ecological balance. The institute conducts training, education and awareness programs in the field of environmental sanitation and health and brings together professionals and workers at all levels of decision making and implementation, both international and local . 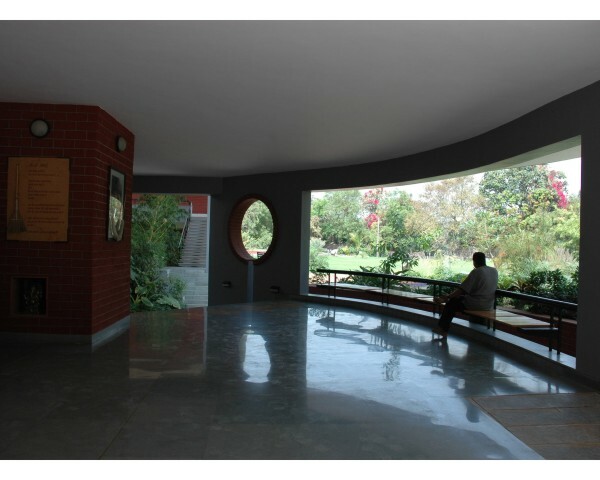 The program includes academic areas, library and resource centre, computer rooms, outdoor demonstration spaces and support spaces like administration, multi purpose halls and also residential spaces both for students and staff. The age group of the students, the participatory rather than instructive nature of learning and the Gandhian idea of learning by living together act as directives in the conception of the idea of the institute as an unrestricted arena for interaction, involvement and interchange. The design responds to the site both at the local and the locational levels. Located in the rural taluk of Sughad in Gandhinagar, the design attempts to retain the rustic ambience of the place. Informal space organization, low skylines, ground hugging profiles replete with plinths and courts, simple material and technology and the imageabilty of distinct parts of the otherwise contiguous builtform through the roof are some of the design features in this attempt. The smaller triangular plot on the southeast is the only accessible area from the road and thus becomes the entry plaza, initializing the movement sequence into the institute. The existence of three trees in this plot is exploited by using them as visual guides in this process. The constriction caused by the junction of the rectangular and triangular plots of land demarcates the main movement route to the institute from the one, which leads to the residential and service areas. The garden on the north orders development along the institutional corridor, which forms the edge between the built and the un-built along the diagonal of the site from the entrance. Residential and service areas are accommodated in the southern half of the development with clear demarcation from the institutional areas. Higher massing at the south west of the site exploits view to the garden as well as shades the lower masses on the north. They also become the main visible feature from the bridge across the canal. The design emphasizes the narrative aspect of spatial experience in which the resolution of the spaces in the institute actively engages the visitor in his explorations. This experiential dimension to architecture, of movement through a sequence of spaces in an episodic manner and the sense of discovery of gradually unfolding spaces, vistas and interconnected elements is epitomized. In this method of space making, the dialogue set up between the visitor and the built environment in the process of understanding the space through the decoding of visual, tactile and sensorial clues personalizes the experience by involving him in it. Thus, the choices presented in the process of moving through the ensemble become the main determinant of the way the space reveals itself to the visitor. 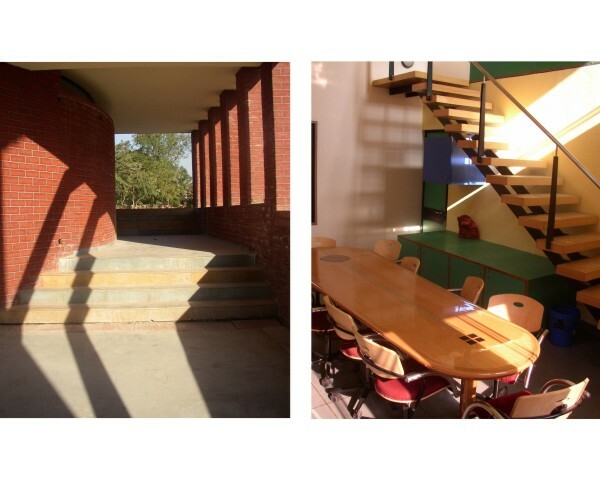 The Gandhian philosophy of austerity, denouncement of ostentation and truth translate into the built environment as the expression of inherent aesthetic of the material and construction without applied decoration, simplicity of form and free flowing, transparent spaces. 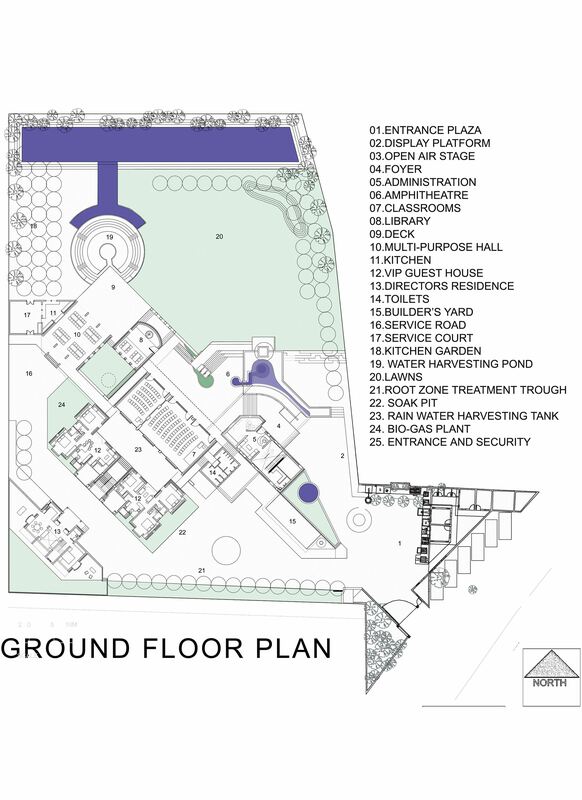 The solution, thus is a series of overlapping spaces with a diverse range of connectivity and relation to other adjacent spaces offering a choice to the student of his degree of participation. Gathering spaces for formal congregation as well as chance meeting and interaction spaces of different scales are carefully ordered in relation to the movement sequence through the institute and in proximity to activity nodes. The built and un-built spaces diffuse into each other extending activities from the covered indoor areas to semi covered and open spaces, being flexible to adapt to various kinds of usage patterns. Courts, balconies, overlooking terraces, shaded verandahs, covered corridors, colonnaded loggias, open decks, plinths and amphitheaters all enrich the space in terms of contrasting light and shade as well as animate the area with activity. The built form, epitomizing and demonstrating the understandings of environmental sustainability is a veritable showcase of an effort in maintaining the ecological balance and harmonizing with nature in the hot, dry climate of Gandhinagar. Orientation to regulate breeze and reduce solar gain are responses to the macro-climatic conditions of the site. Increased massing towards the south west exploits shaded areas to the north east by accommodating the activity areas, courts and streets along them. North facing terraces in the upper floors, decks and open to sky plinths provide multiple use probabilities. Fenestration regulated to control convective heat loss and optimize daylighting are features integrated with the design. Design decisions are made with the priority of regulating the microclimate for comfort conditions. Brick cavity walls insulate the interiors from the high ambient atmospheric temperatures and incoming solar radiation. Subterranean builtform along with shared adjacent walls prevents excessive heat gain from exposure to the sun. Massing is selectively controlled to provide mutual shade and maximize shadow, breaking up continuous surfaces and thereby reducing reflected glare. Overhangs determined by shadow-throw studies and sun angle analysis over the year control solar penetration and also help in reducing atmospheric glare in the interiors. In terms of managing available resources of land, the landscape design facilitates and fosters microclimate control. Local shading by trees are used to an advantage in situations with south facing walls. Wind turbulences and eddy spaces formed by both built form and vegetation assist dust control and are positively used as open air activity areas. Ground cover vegetation helps in the prevention of soil erosion and also aids surface glare control. Land management and landscape treatment in terms of cut and fill on the flat site for solar passive design like berming, evaporative cooling and sunk levels also create spatial and visual interest. Orchards and kitchen gardens are active and productive means of optimizing available resources like land in the setback margin, treated sullage for irrigation, mulched organic waste from the kitchen as manure etc. These features not only absorb these effluents which would otherwise go waste and need management but also yield produce as a by-product of the landscape effort for no extra cost, participating in the sustainability of the system and actually adding value. 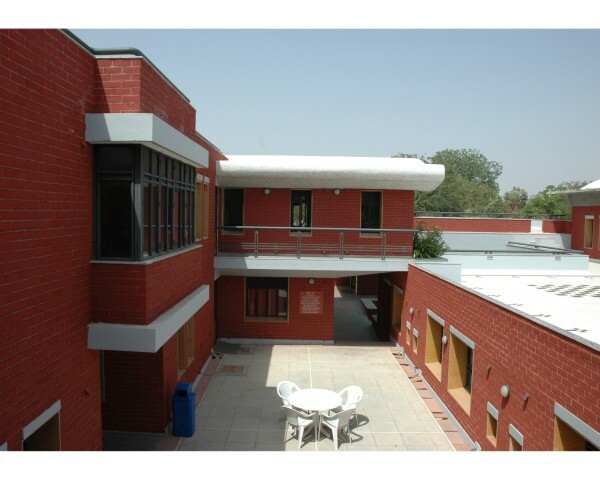 The combined water requirement of the institute, for drinking, sanitation and gardening purposes have been met by rain water harvesting, both from the roofs as well as from the open ground and garden. The clearer and unsullied water collected from the roof is stored in an underground tank and supplements the flushing water requirements of the toilets. A controlled amount of the surface runoff from the ground is stored in an open air tank which becomes a major feature in the landscape of the garden and also satisfies the gardening water requirement of the entire year. Ground water recharging from percolating wells are combined with sullage treatment by root-zone tanks to return water to the ecosystem in a naturalized and harmless way. Organic solid waste is used to make bio-gas which fuels the kitchen and is also managed through soak pits. Lavatories designed with minimized water-borne carriage system enhance performance of these techniques at the same time maintain high standards of sanitation. Solar photovoltaic and heating panels along with humidifiers and fans are envisaged as low-energy, active means of controlling the microclimate to supplement the solar passive design.This balance of priorities, from energy to ecological sustainability, administrative ideology to design philosophy, all come together harmoniously in creating a high quality, low energy, sustainable environment which reflects the ideals it stands for without compromising on its international, contemporary outlook as a premier educational institute.